That time of year has come round again. Wow Gospel is about to drop in the UK and as always has a huge lineup of the year’s biggest tracks. As is often the case with Wow Gospel, many of the tracks you’ll already have from individual downloads or from the original albums but it’s always good to have so many of the hits in one place. Plus it’ll help you stumble across some of the tunes you ought to own but slept on when they first came out. The tracklisting reads well. Opening up with Fred Hammond – Awesome God, it starts as it means to go on. Youthful Praise follows, leading on to one of the stand out artists of 2010 – Marvin Sapp. One disc two, there’s an appearance for the anthem of last year – Nobody Greater by Vashawn Mitchell. Speak by Myron Butler & Levi is also here. It must have been difficult to choose just one track from that album because Revealed is an album full of highlights. Tracks from the likes of Kiki, Mary Mary and Israel Houghton are a reminder this is a celebration of the year’s biggest artists as well as the tracks but songs such as God in Me still gets a lot of airplay even in 2011 and remain relevant. 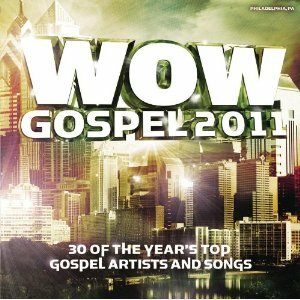 Wow Gospel 2011 is out now in the states but comes in the UK real soon. Check it out.